Back cover blurb: London, 1941. Emmeline Lake and her best friend Bunty are trying to stay cheerful despite the Luftwaffe making life thoroughly annoying for everyone. Emmy dreams of becoming a Lady War Correspondent and when she spots a job advertisement in the newspaper she seizes her chance – but after a rather unfortunate misunderstanding, she finds herself typing letters for the formidable Henrietta Bird, the renowned agony aunt of Woman’s Friend magazine. Mrs Bird is very clear: letters containing any form of Unpleasantness must go straight into the bin. But as Emmy reads the desperate pleas from women who may have Gone Too Far with the wrong man, or can't bear to let their children be evacuated, she decides the only thing for it is to secretly write back . 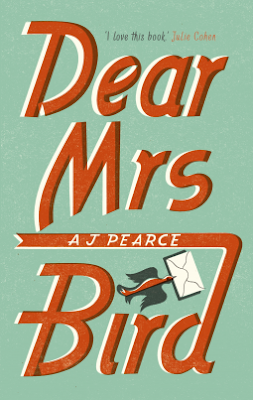 . . Irresistibly funny and enormously moving, Dear Mrs Bird by AJ Pearce is a love letter to the enduring power of friendship, the kindness of strangers and the courage of ordinary people in extraordinary times. Dear Mrs Bird is a beautifully written novel about a young girl with dreams of becoming a war correspondent. Emmeline Lake, better known as Emmy or Em is Marigold (Bunty) Tavistock is working days as a waitress and nights as a volunteer answering telephones for the (Auxiliary Fire Service) AFS, when she sees an advert for a job in a local newspaper office. Partly through the bumbling, thoroughly unorganised and endearing Mr. Collins who interviews her and partly through her own skim reading of the advertisement, Emmy accepts the job without realising it is for a magazine housed in the same building as the newspaper, Women’s Friend. Her boss is Mrs. Henrietta Bird, Assistant Editoress of the magazine and a formidable and curmudgeonly woman. Mrs. Bird is the editor of the popular “Henrietta Helps” page of the magazine. However, contrary to the advice columns of today, Mrs Bird is blunt, borderline rude in her responses and doesn’t respond to many of the letters she is sent. She in fact has a list of “undesirable” letters that absolutely must not land on her desk under any circumstances. These include tales of affairs with forgeign soilders, unexpected (but not necessarily unwanted) pregnancies and very ordinary marriage troubles. Emmy thinks it scandalous that Mrs. Bird won’t even acknowledge women in need, let alone answer their letters. So she sees it as her duty, as a fellow, spirited young woman to write back in secret and give them advice. Dear Mrs. Bird is a delightfully British account of a young girl in war time Britain. There is a very sensitive authenticity about this novel, it tackles some difficult subjects brilliantly, and I just loved the ending. A really lovely novel. Dear Mrs Bird is available now via Amazon online and all good book shops.